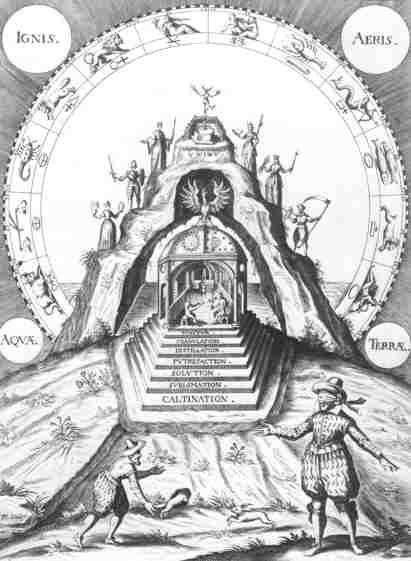 Spiritual alchemy experienced in the Middle Ages its European revival in secret circles. 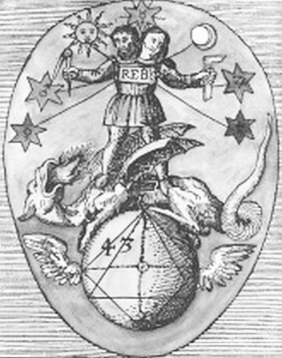 Books like "Rosarium philosophorum", "Atlanta fugiens", "Philosophia Reformata" and the 22 tarot cards of the Visconti Tarot concealed their secret knowledge into symbols and provoked the attention of the church and of the authority just as the medieval Rosicrucians. The alchemy, whose goal of 'making gold' attracted derision, offered a simple way of disguising a mental process, which was seldom practically implemented. Even the esoteric Freemasonry with reference to 'Hiram Abiff' took place in closed circles. The well known "OM" as Mantram of the indish Raja Yoga was implemented as "O"pus "M"agnum because the whole process can be achieved - even without detailed secret knowledge and very stolid - by bearing in mind a pure way of life and of course with the necessary VAK within this OM- mantra-meditation. The "Opus Magnum", the "Great Work of perfection"